War zone survivor Abdul gives hate crime the boot | News by Wales Express News, People Before Profit! 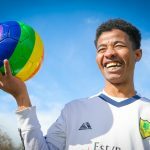 A refugee from Sudan who fled his war-torn homeland after witnessing people murdered in front of him was among the players at a community football match. 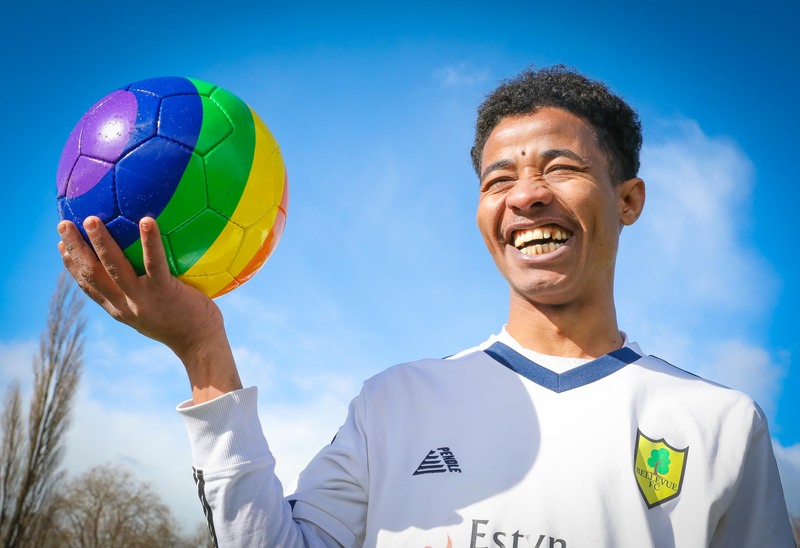 Abdul Ahmed, now 20 and living in Wrexham, was taking part in the second ever Community Cup game which was set up with the goal of eliminating hate crime and promoting tolerance around the world. The avid football fan, who supports Cardiff City and Wrexham AFC because they are the places where he finally began to feel safe again, is now a rising star of Bellevue FC. In the event they defeated the Wrexham Disability Supporters Association All-Stars 5-3 but even before the whistle blew the two managers, Steve Gilbert and Delwyn Derrick, agreed that whatever the result, both teams would be winners in spirit. The match was preceded by a minute’s silence in remembrance of the 50 killed and dozens more injured at last week’s Christchurch mosque horrific massacre in New Zealand. North Wales Police and Crime Commissioner Arfon Jones, an outspoken voice against hate crime said the news was a shocking, heart rending and pointed reminder of the reasons why everything possible should be done to counter hate crime and prejudice in North Wales and around the world. Cheering on from the sidelines with the police and crime commissioner were Wrexham AFC legend Dixie McNeil and the town’s MP, Ian Lucas. Abdul Ahmed has not seen or heard from his family for more than five years and does not even know if they are still alive. They live in a small village in Sudan where the population was targeted and persecuted during the brutal ongoing civil war. He was forced to gather his few belongings as a teenager and leave the village to escape the senseless violence all around him. As the village has no wi-fi, phones or other modern means of communication Abdul has had no way of contacting them since. After an arduous three-month journey over more than five countries he arrived in Britain where he was given asylum, going on to live first in Cardiff and now Wrexham. After his terrifying experiences as a poverty stricken and frightened refugee, Abdul said it was the tolerance and the generous friendship of his Bellevue FC teammates that made him feel welcome in Wrexham. The town offered him a hospitable and peaceful haven after a daunting mentally and physically exhausting journey to Britain from Sudan via Libya, Italy, and France. It included a dangerous boat voyage from Sudan to Libya, and a short spell at the Calais Jungle refugee camp in France where he had to live on his wits. But now having made friends in Wrexham Abdul said through the local football community he had begun to feel safe again and that his new footballing ‘family’ was helping him overcome the nightmare experience of having endured a childhood immersed in civil war and persecution in Sudan. Abdul loves his weekly training sessions with Bellevue FC and was overjoyed to be part of the Community Cup tie. He is just one of the members of an ethnically diverse team in which many of the players have similar tales of hardship to tell. Speaking at a post-match celebration at Ty Pawb, Wrexham, the police and crime commissioner said: “I have been saying for some time now that football is a great conduit for bringing communities together and in a time of very divisive political rhetoric, this is really important. A long-standing fan of Wrexham FC, the Commissioner also thanked Steve Gilbert, chair of its Disability Supporters Association, for his excellent work increasing and improving facilities for disabled fans at Wrexham.